Showerproof Peva With Breathable Gussets - For Travel & Storage! Soft feel shower proof PEVA material for protection when on the move. Breathable polypropylene gussets allowing air to circulate when in storage. 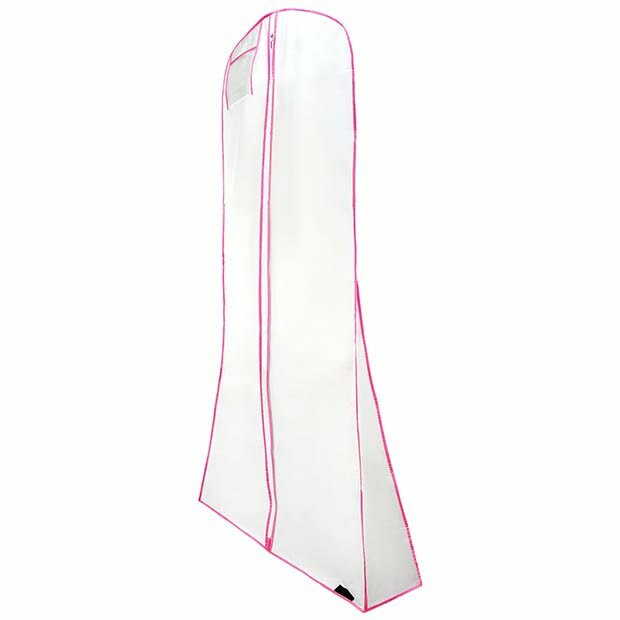 Ideal for wedding gowns, bridesmaids dresses, prom dresses & ball gowns. Bell shaped gusset allowing plenty of room for petticoats, trains etc without crushing them. Double stitched edge piping and zip trim with clear identity pouch. Quality full length zip, shaped shoulders & top hole for hanger hook. Reinforced loop allowing garments to be easily carried folded in half. Size: Length x Width 72'' x 22'' (183cm x 56cm) approx.